If you’re turning up to Chester Live this year after a hard week, there’s only one place you should go: Telford’s Warehouse, Friday 23rd June. Why? 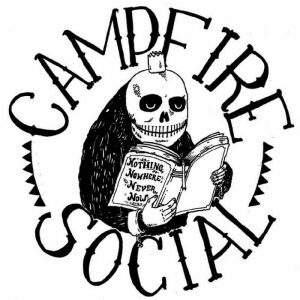 Because you’ll get to see Campfire Social, of course! And these guys are masters of the craft of providing an uplifting, airy and charmingly melancholic sound, certain to rid any listener of stress and inhibitions. 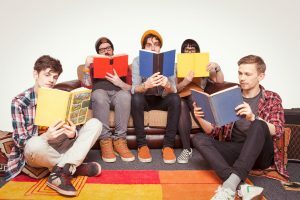 The local melodic indie five-piece consists of guitarists Thomas Hyndman and Christopher Hembrough-Done, Keyboardist and glockenspiel player Carrie Hyndman, Drummer Tom Mason and bassist Rhys Mather. Vocals will be handled by all. Campfire Social are set to put on a cracking show, so Chester Live interrupted their band practice for a chat. Are you working on anything new or just practicing for the gig? We’re just trying to make the songs sound as good live as on the EP! And what’s this EP called? Tom H: It’s a secret! Carrie: Is it a secret? Tom H: The EP will be called Wellbeing. Tom H: Five new tracks which will be released from the day of our Chester Live show! The one we’re doing at Telford supporting Peaness. That will be the first time that you can buy a physical copy. So people going to that gig will be there first people to hear these songs you’re practicing now? Tom H: Oh yes. Always! Have you guys played Telfords before? Tom H: Yeah, it’s a home ground. What sort of energy are you going to bring? Rhys: I want to say mosh pit. Tom H: Yeah! Mosh pit! Carrie: I’d like to say mosh pit but I don’t know whether it’ll happen. Tom H: We’re a lot more rounded and a bigger sound than we once were, if you may have known us or heard our last EP. It’s a much bigger structure and it’s definitely more danceable. There are parts which you would look a bit silly moshing to, but you can if you want. Carrie: We would never frown upon it! Tom H: Definitely, you’ll be able to mosh a bit more than you used to! Is Chester Live part of a wider tour? Tom H: We’re doing three gigs in June at the moment, but that may change. Bethesda, and then two for Chester Live; we’ve got the Street Festival on Sunday as well as Telfords. Where else do you play? Everywhere around the country or just the North Wales/North West area? Tom H: No, everywhere and anywhere! Anywhere that’ll have us. We’ve got a Cardiff gig in two weeks’ time. Carrie: We’re playing in Manchester on Saturday! Chris: That’s North West but we’re looking to push out. One last thing you’d like to say to hype everyone up? Carrie: We’re great with words aren’t we? We’re dead excited! Chris: We’re more lively now. Tom H: It’s gonna be a decent gig for several reasons. We’re excited about releasing our EP; we’re always excited to play in Telfords because it’s our home ground and there’s always a decent crowd so we can get a good thing going; we’re supporting Peaness who are our buddies. And together we will put on one massive banging gig! It will be a dead good night. Carrie: And soon we will take over the world. Tom H: Pop Tinnitus is the type of music we play. Catch Campfire Social at Chester Live 2017 on Friday 23rd June 2017 supporting Peaness at Telfords Warehouse. Tickets can be purchased from www.chesterlive.co.uk.